A review of In the Shadow of Empire and Nation: Chilean Migration to the United States Since 1950, by Cristián Alberto Doña Reveco. During the second half of the twentieth century, Chile became a nation of emigrants. While many Chileans departed for other regions of Latin America and beyond, foreign-born individuals remained a small proportion of Chile’s domestic population, never exceeding two percent of the total. The United States has been among the primary destinations for Chileans who chose to leave their home country. Covering the period from 1950 to 2010, Cristián Alberto Doña-Reveco’s doctoral dissertation examines four phases of this post-World War II migration from Chile to the U.S. These include: a first period following the Second World War; a second wave after General Augusto Pinochet’s coup of September 11, 1973; a third stage during the military dictatorship’s 1982 economic crisis; and a fourth phase that followed the return of democratic governance to Chile in 1990. By integrating thick description from migrants’ testimonials with demographic data and theoretical insights from several disciplines, the author examines “the intersection of biographical accounts with historical changes and social structures in each of the periods mentioned.” His analysis of the interplay between individual agency and overarching historical factors operates at three levels: “The macro level of the state and interstate relations in the international system; the meso level of institutions and organizations; and the micro level of migrants’ biographies” (p. 5). Using this tripartite framework, Doña-Reveco pursues four central research questions: 1) What are the social, political, and historical conditions that explain Chileans’ choices to migrate during the second half of the twentieth century? 2) How should we characterize various waves of migration? 3) What memories do migrants retain of recent visits to Chile? 4) Do their reasons for migrating shape their enduring connections with their homeland? In his search for answers, the author interviewed thirty Chilean immigrants living in Chicago, Detroit, and the Greater Lansing (Michigan) area and combined these oral histories with a wealth of census and migration data from archives and databases in Chile and the United States. The result is an impressive interdisciplinary effort, which artfully merges historical approaches with sociological methods. In the process, Doña-Reveco contributes to a more comprehensive understanding of migration in the Americas and pursues new lines of inquiry about how the experience of immigration has shaped – and has been altered by – inter-state relations between the U.S. and Chile. The author builds his argument across nine well-crafted chapters, which proceed in a refreshing, jargon-free style. Chapters 1 and 2 introduce readers to the dissertation’s concepts and theoretical models, survey the relevant literature in the field of migration studies, and establish Doña-Reveco’s most crucial innovation, namely the integration of social memory concepts into analyses of structural decisions to migrate. Chapter 3 briefly summarizes pre-1950 Chilean migration to the U.S. and then analyzes stocks and flows of Chilean migrants during the four periods under review. Chapters 4 through 7 look at each of these phases in greater detail, while the eighth chapter examines how Chilean migrants living in the U.S. remember Chile and their complex choices to depart from or re-visit their homeland. In Chapter 9, the author offers concluding thoughts and directions for future research, which include applying his migration-decision model to the emigrant populations of other South American nations. In Chapters 4 through 7, Doña-Reveco is particularly attentive to the role of ideology in shaping migrants’ perceptions of the United States as a destination and Chile as a homeland. Between 1950 and the 1973 coup that overthrew Salvador Allende’s democratically elected socialist government, adventuresome migrants were motivated by widely held beliefs about the U.S. as “the beacon of modernity” (p. 131). In contrast, during Chile’s military dictatorship (1973-1990), the institutionalization of political violence, the adoption of unbending neoliberal structural adjustment policies, and the experience of U.S. interventions in the country’s domestic life shaped an array of more sober migratory decisions and created painful conditions of exile. As Doña-Reveco demonstrates in Chapter 7, the neoliberal economic order of the 1970s and 1980s remained deeply entrenched in Chilean society, even after the transition to free elections and a nominally “open” society in the 1990s. These hyper-marketized social conditions produced a highly polarized nation of “winners and losers” who express radically different reasons for choosing to leave Chile (p. 258). Doña-Reveco’s dissertation title, “In the Shadow of Empire and Nation,” reflects the author’s deep-seated awareness that ideology and transnational power relations drastically inflect the choices migrants make, the terms with which they frame these decisions, and the ways in which they recall their acts of relocation. Throughout the project, he pursues the theme of “an imperial relationship, in which the policies and actions of the US government, in addition to a host of socioeconomic and cultural interactions have had a strong influence within Chile” (p. 323). In doing so, the author connects migrants’ historical consciousness of this fluctuating Pan-American relationship with their choices to depart the land of their birth. This approach allows Doña-Reveco to add new levels of nuance to migration decision-making theories. Among the most invigorating features of this dissertation are the voices of the migrants with whom Doña-Reveco spoke. As one exile who departed Chile during the military dictatorship told the author, “I kept thinking about my contradictions. Because in spite that I declare that I do not want to go back to live in Chile, I have kept my nationality, I state that I feel Chilean, and I am doing everything I can for my children to obtain that nationality” (p. 276). Through his technique of interspersing vivid testimonials from interviewees with theoretical discussions about macro-historical events, Doña-Reveco succeeds at personalizing the social dimensions of international relations. Bridging the chasm between academic models and lived experiences is a crucial task for any scholar who aims to do more than interpret the world in increasingly abstract ways. 30 in-depth interviews with Chilean migrants to the U.S.
Immigration statistics from the United States Immigration and Naturalization Services, the US Citizenship and Immigration Services, and the Office of Immigration Statistics Census data on foreign born and native born from the PUMS (Public Use Microdata Samples) data from the US census. Michigan State University. 2012. 391 pp. Primary Advisors: Brendan Mullan and Peter Beattie. 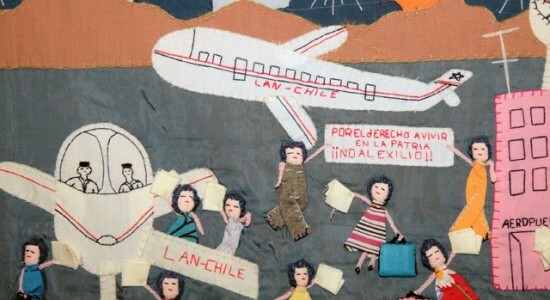 Image: Arpillera, Marjorie Agosín: Exilio / Exile (Women at the Airport). Harbour Museum, Derry.